Noah Webster (1758–1843), the author of the readers and spelling books which dominated the American market at the time, spent decades of research in compiling his dictionaries. His first dictionary, A Compendious Dictionary of the English Language, appeared in 1806. In it, he popularized features which would become a hallmark of American English spelling (center rather than centre, honor rather than honour, program rather than programme, etc.) and included technical terms from the arts and sciences rather than confining his dictionary to literary words. Webster was a proponent of English spelling reform for reasons both philological and nationalistic. In A Companion to the American Revolution (2008), John Algeo notes: "it is often assumed that characteristically American spellings were invented by Noah Webster. He was very influential in popularizing certain spellings in America, but he did not originate them. Rather [...] he chose already existing options such as center, color and check on such grounds as simplicity, analogy or etymology". In William Shakespeare's first folios, for example, spellings such as center and color are the most common. He spent the next two decades working to expand his dictionary. In 1841, 82-year-old Noah Webster published a second edition of his lexicographical masterpiece with the help of his son, William G. Webster. Its title page does not claim the status of second edition, merely noting that this new edition was the "first edition in octavo" in contrast to the quarto format of the first edition of 1828. Again in two volumes, the title page proclaimed that the Dictionary contained "the whole vocabulary of the quarto, with corrections, improvements and several thousand additional words: to which is prefixed an introductory dissertation on the origin, history and connection of the languages of western Asia and Europe, with an explanation of the principles on which languages are formed. B. L. Hamlen of New Haven, Connecticut, prepared the 1841 printing of the second edition. When Webster died, his heirs sold unbound sheets of his 1841 revision American Dictionary of the English Language to the firm of J. S. & C. Adams of Amherst, Massachusetts. This firm bound and published a small number of copies in 1844 – the same edition that Emily Dickinson used as a tool for her poetic composition. However, a $15 price tag on the book made it too expensive to sell easily, so the Amherst firm decided to sell out. Merriam acquired rights from Adams, as well as signing a contract with Webster’s heirs for sole rights. The third printing of the second edition was by George and Charles Merriam of Springfield, Massachusetts, in 1845. This was the first Webster's Dictionary with a Merriam imprint. Lepore (2008) demonstrates Webster's innovative ideas about language and politics and shows why Webster's endeavours were at first so poorly received. Culturally conservative Federalists denounced the work as radical—too inclusive in its lexicon and even bordering on vulgar. Meanwhile, Webster's old foes, the Jeffersonian Republicans, attacked the man, labelling him mad for such an undertaking. Noah Webster's assistant, and later chief competitor, Joseph Emerson Worcester, and Webster's son-in-law Chauncey A. Goodrich, published an abridgment of Noah Webster's 1828 American Dictionary of the English Language in 1829, with the same number of words and Webster's full definitions, but with truncated literary references and expanded etymology. Although it was more successful financially than the original 1828 edition and was reprinted many times, Noah Webster was critical of it. Worcester and Goodrich's abridgment of Noah Webster's dictionary was published in 1841 by White and Sheffield, printed by E. Sanderson in Elizabethtown, N.J. and again in 1844 by publishers Harper and Brothers of New York City, in 1844, with added words as an appendix. Upon Webster's death in 1843, the unsold books and all rights to the copyright and name "Webster" were purchased by brothers George and Charles Merriam, who then hired Webster's son-in-law Chauncey A. Goodrich, a professor at Yale College, to oversee revisions. Goodrich's New and Revised Edition appeared on 24 September 1847, and a Revised and Enlarged edition in 1859, which added a section of illustrations indexed to the text. His revisions remained close to Webster's work, but removed what later editors referred to as his "excrescences". James A.H. Murray, the editor of the Oxford English Dictionary (1879–1928) says Webster's unabridged edition of 1864 "acquired an international fame. It was held to be superior to every other dictionary and taken as the leading authority on the meaning of words, not only in America and England, but also throughout the Far East." 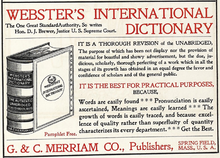 The Merriam Company issued a complete revision in 1909, Webster's New International Dictionary, edited by William Torrey Harris and F. Sturges Allen. Vastly expanded, it covered more than 400,000 entries, and double the number of illustrations. A new format feature, the divided page, was designed to save space by including a section of words below the line at the bottom of each page: six columns of very fine print, devoted to such items as rarely used, obsolete, and foreign words, abbreviations, and variant spellings. Notable improvement was made in the treatment and number of discriminated synonyms, comparisons of subtle shades of meaning. Also added was a twenty-page chart comparing the Webster's pronunciations with those offered by six other major dictionaries. This edition was reprinted in 1913. Being in the public domain and having been scanned and OCRd, this edition has had substantial influence on Wiktionary. Early printings of this dictionary contained the erroneous ghost word dord. After about a decade of preparation, G. & C. Merriam issued the entirely new Webster's Third New International Dictionary of the English Language, Unabridged (commonly known as Webster's Third, or W3) in September 1961. Although it was an unprecedented masterwork of scholarship, it was met with considerable criticism for its descriptive (rather than prescriptive) approach. The dictionary's treatment of "ain't" was subject to particular scorn, since it seemed to overrule the near-unanimous denunciation of that word by English teachers. Since the 1961 publication of the Third, Merriam-Webster has reprinted the main text of the dictionary with only minor corrections. To add new words, they created an Addenda Section in 1966, included in the front matter, which was expanded in 1971, 1976, 1981, 1986, 1993, and 2002. However, the rate of additions was much slower than it had been throughout the previous hundred years. Following the purchase of Merriam-Webster by Encyclopædia Britannica, Inc. in 1964, a three-volume version was issued for many years as a supplement to the encyclopedia. At the end of volume three, this edition included the Britannica World Language Dictionary, 474 pages of translations between English and French, German, Italian, Spanish, Swedish, and Yiddish. 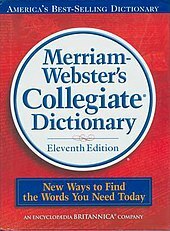 A CD-ROM version of the complete text, with thousands of additional new words and definitions from the "addenda", was published by Merriam-Webster in 2000, and is often packaged with the print edition. The third edition was published in 2000 on Merriam-Webster's website as a subscription service. Planning for a Fourth edition of the Unabridged began with a 1988 memo from Merriam-Webster president William Llewellyn, but was repeatedly deferred in favour of updates to the more lucrative Collegiate. Work on a full revision finally began in 2009. In January 2013 the Third New International website service was rebranded as the Unabridged with the first "Release" of 4,800 new and revised entries added to the site. There were two further "Releases" in 2014. The revised website is not branded as the "Fourth edition" and it is unlikely that a print version will ever be produced, because demand is declining and its increased size would make it unwieldy and expensive. In addition to its Collegiate editions G. & C. Merriam Co. also produced abridged editions for students (Primary School, Elementary School, Secondary School, High School, Common School, Academic) as well as for general public (Condensed, Practical, Handy). The first edition of the abridged Primary School dictionary was prepared by Noah Webster in 1833 and later revised by William G. Webster and William A. Wheeler. Below is a list of years of publication of the Collegiate dictionaries. Since then, use of the name Webster has been rampant. Merriam-Webster goes to great pains to remind dictionary buyers that it alone is the heir to Noah Webster. Although Merriam-Webster revisers find solid ground in Noah Webster's concept of the English language as an ever-changing tapestry, the issue is more complicated than that. Throughout the 20th century, some non-Merriam editions, such as Webster's New Universal, were closer to Webster's work than contemporary Merriam-Webster editions. Further revisions by Merriam-Webster came to have little in common with their original source, while the Universal, for example, was minimally revised and remained largely out of date. After the commercial success of Webster's Third New International in the 1960s, Random House responded by adapting its college dictionary by adding more illustrations and large numbers of proper names, increasing its print size and page thickness, and giving it a heavy cover. In 1966, it was published as a new "unabridged" dictionary. It was expanded in 1987, but it still covered no more than half the actual vocabulary of Webster's Third. The American Heritage Publishing Co., highly critical of Webster's Third, failed in an attempt to buy out Merriam-Webster and determined to create its own dictionary, The American Heritage Dictionary of the English Language. In 1969, it issued a college-sized dictionary. Now in its fifth edition, it is only slightly greater in vocabulary than the Collegiate, but it appears much larger and has the appeal of many pictures and other features. Other medium-sized dictionaries have since entered the market, including the New Oxford American and the Encarta Webster's, while Merriam-Webster has not attempted to compete by issuing a similar edition. ^ "Merriam-Webster FAQ". Retrieved 2008-01-24. ^ -or. Online Etymology Dictionary. ^ "Catalog entry". Library of Congress. ^ Skeel, Emily. A Bibliography of the Writings of Noah Webster (1958), p. 234. ^ a b "Rulon-Miller Books :: Recent Acquisitions". ^ Noah Webster, An American Dictionary of the English Language, second edition (New Haven, Connecticut: the author, 1841). ^ Noah Webster, An American Dictionary of the English Language, second edition (Amherst, Massachusetts: J. S. & C. Adams, 1844). ^ Noah Webster, An American Dictionary of the English Language, second edition (Springfield, Massachusetts: George & Charles Merriam, 1845). ^ Jill Lepore, "Introduction" in Arthur Schulman, Websterisms: A Collection of Words and Definitions Set Forth by the Founding Father of American English (Free Press, 2008. ^ Landau, Sidney (2001). Dictionaries: The Art and Craft of Lexicography (2nd ed.). Cambridge University Press. ISBN 0 521 78512 X. ^ "United States Court of Appeals, Seventh Circuit". Retrieved September 13, 2010. ^ Skinner, David (July–August 2009). "Webster's Third: The Most Controversial Dictionary in the English Language". Humanities magazine. National Endowment for the Humanities. 30 (4). Retrieved 2014-09-14. ^ Fatsis, Stefan (January 12, 2015). "The Definition of a Dictionary". Slate.com. Retrieved April 25, 2015. ^ Metcalf, Allan (12 June 2013). "Unabridged Online". The Chronicle of Higher Education. Retrieved 19 January 2018. ^ "Merriam-Webster Continues Noah Webster's Legacy". www.merriam-webster.com. Retrieved 2018-05-12. ^ "Fascinating facts about Philip Parker inventor of the W-O-D Project in 1999". Ideafinder.com. Vaunt Design Group. 2006-11-01. Archived from the original on 2010-08-31. Retrieved 2010-08-31. ^ "Webster's Online Dictionary – Definition: dictionary". websters-online-dictionary.org. ICON Group International, Inc. Archived from the original on 2010-08-29. Retrieved 2010-08-29. Gove, Philip B. (1961). Webster's Third New International Dictionary. Preface. G. & C. Merriam. Leavitt, Robert Keith (1947). Noah's Ark New England Yankees and the Endless Quest: a Short History of the Original Webster Dictionaries, With Particular Reference to Their First Hundred Years. Springfield: G. & C. Merriam. Lepore, Jill (November 6, 2006). "Noah's Mark: Webster and the original dictionary wars". The New Yorker: 78–87. Morton, Herbert C. (1994). The Story of Webster's Third: Philip Gove's Controversial Dictionary and Its Critics. Cambridge and New York: Cambridge University Press. ISBN 0-521-46146-4. Neilson, William A.; et al. (1934). Webster's New International Dictionary. Preface and Introduction (Second ed.). G. & C. Merriam. Rollins, Richard M. (1980). The Long Journey of Noah Webster. Philadelphia: The University of Pennsylvania Press. ISBN 0-8122-7778-3. Skinner, David (2012). The Story of Ain't: America, Its Language, and the Most Controversial Dictionary Ever Published. New York: HarperCollins. ISBN 0-0620-2746-8. Sledd, James; Ebbit, Wilma R., eds. (1962). Dictionaries and That Dictionary. Chicago: Scott Foresman. Plain-text versions are also available from the Internet Archive (with some errors, due to automatic optical character recognition). 1841 edition (published 1844) on the Emily Dickinson site. The last edition of the American Dictionary of the English Language that Noah Webster made before his death. An American Dictionary of the English Language, edited by Chauncey A. Goodrich. An American Dictionary of the English Language, edited by Chauncey A. Goodrich, first pictorial edition.